Something about the size and opulence of 1950s Detroit confections makes you expect they are all out of reach of the low-buck hobbyist, but in some cases, you’d be wrong – you just have to shop carefully. And even if you shop carefully, then you have to be cautious about looking for a bodge repair done in the 1970s when it was just a fully-depreciated used sedan. For 1955, the third-generation Coronet became Dodge’s low-line entry in the market, although it did offer some useful upgrades like power windows and safety door locks, and on higher line models, Dodge’s Red Ram V8. As a low-line model, though, it certainly still carried a lot of the optimistic design of post-war America. 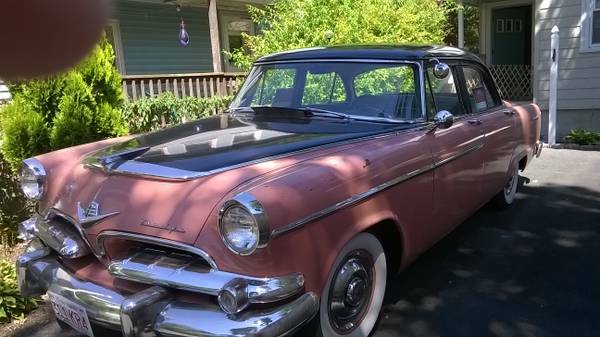 Check out this 1955 Dodge Coronet for sale for $4000 in Quincy, MA. Royalty was clearly the Chrysler way of achieving an aura of prestige around their metal – the Imperial, Windsor, Royal, and Custom Royal were all names used in that period. That and chrome, and lots of it – on the bumpers, on the hood, the hood ornament, the body side trim, the hubcaps, the mirrors, and the door handles. The car is said to have 60,000 indicated miles, though the seller admits this might not be the true mileage. The body is finished in rose (it’s not pink! my car is not pink!) with black on the roof and center of the hood, giving it quite some presence. Somehow, the pink finish does not look as vulgar as on the stereotypical 1959 Cadillac – perhaps it’s the smaller size of the car, or those black accents, that help tone it down. 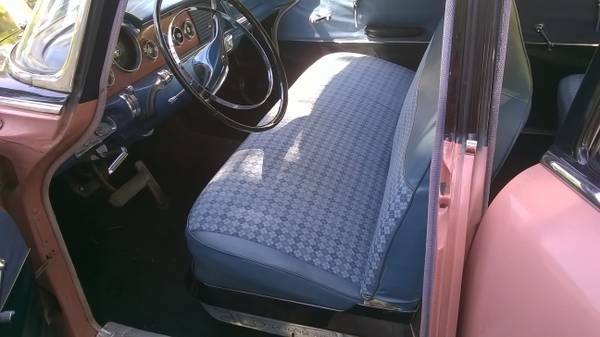 The interior looks to be in nice condition with original-looking seat covers. Limited use of pink on the interior also helps keep things under control. In fact, blue and pink is a rather odd color combination, so perhaps this is not the original exterior color. 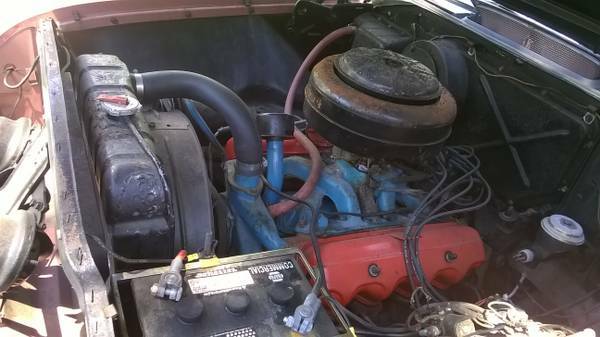 That said, the seller believes the car to be all-original, complete, and uses it as an occasional daily driver – a seemingly paradoxical description, but probably meant to indicate that he trusts it enough to drive it to work semi-regularly. The car also comes with the optional turn signals (so that’s not just a joke, they really were optional at one point!). 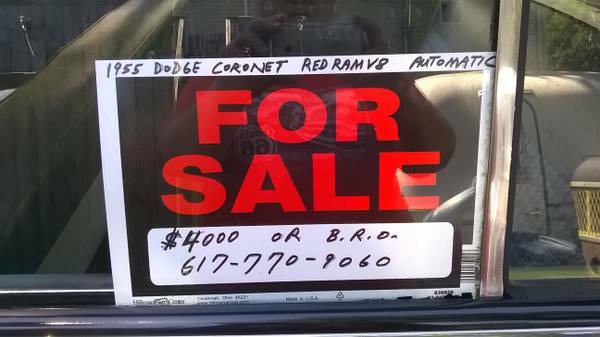 The engine is Dodge’s Red Ram V8, using 270ci of hemispherical combustion chambers to put out 183hp. Given the size and probable weight of this car, it’s probably sufficient for fast freeway cruising, but won’t win any drag races. The car is fitted with the two-speed Power Flite automatic transmission, with dash-mounted Flite Control (were returning WW2 and Korean War vets unable to spell?) shifter. Overall, this looks like a remarkably affordable entry into the chrome boat era of American motoring – would you give it a try? This entry was posted on September 2, 2014 at 11:22 am and is filed under Feature. You can follow any responses to this entry through the RSS 2.0 feed. You can leave a response, or trackback from your own site. I so remember pink cars. Desoto’s and Cadillac’s, beautiful. Cars are boring now unless you can afford a luxury one. We had fun! I know what O.B.O. is , but am unfamiliar with B.R.O. Bring a Real Offer, maybe? Hmm, searching online yields Best Realistic Offer… not that I’d ever heard the expression before either. How about “Best resonable offer”.